Editor’s Note: This retrospective explains how, in the course of his research projects, the author, LLB Fellow, had to ‘deal with’ vitamin problems more than once, for example with anti-B6 vitamins as a trigger for cannibalism (Topic 1), with the application of the vitamin C complex as stabiliser (Topic 2) and the non-existence of "vitamin B15" used for medical purposes despite the risk (Topic 3). Vitamins or vitamin complexes, respectively, are organic compounds which must be introduced into an organism in small quantities and cannot be synthesised by this organism. They actively contribute to the intermediary metabolism. In each case, a definition what this organism is must be made. The vitamins B6 (pyridoxine, adermin) and C are complexes; B6 comprises pyridoxol, pyridoxamine and pyridoxal (3b, 9b), the vitamin C complex consists of L-ascorbic acid [IIa] plus dehydroascorbic acid [IIb] (3a). In the above-mentioned lectures, all of the vitamins and the anti-vitamins important for research were addressed. Special attention was given to the determination of the overall vitamin C [IIa plus IIb]. The methodology is described in (3a); cf. also Plate 2 in the APPENDIX. "Cannibalism in animals triggered suddenly by the oral administration of the anti-B6 vitamin: 4-deoxy-pyridoxine (I)"
A cannibal is an animal that feeds on other of its own species. This is not an unnatural characteristic: around 140 different species show cannibalistic tendencies under various conditions. It occurs among mammals and birds, especially when food is scarce (4). Cannibalism triggered suddenly by the administration of I [4-deoxy-pyridoxine = 2-methyl-3-hydroxy-4-methyl-5-hydroxymethyl-pyridine (9b)] to pregnant mice of the strain NMRI and stopped immediately as soon as the administration of I was discontinued (5a,b). The possibility to create cannibalism and eliminate it again right away was detected by chance in 1955 when we obtained positive results in the study of "the influence of the gender ratio of new-born rodents before and during copulation" (6) and related this result to the vitamin B6 complex (B6-deficit), well aware that B6 is involved in reproduction. Starting from the observation that more girls than boys are born during war years as a result of the restricted diet [subsequently corroborated by discussions with the Professor for Medical Statistics, Dr. Karl Freudenberg (nicknamed "Kugelkarl)] we carried out five series of experiments on mice over several years (1955 to 1962), first using 1000 ♂ to 4000♀ animals per experimental series (6). In the experimental series, we "starved" the male mice by keeping their body weight constant at 20 g over the entire period. Under these circumstances, they were still strong enough to copulate. The condition was that four female mice were available to one male mouse [a condition we had established as early as 1938 in connection with other issues (7)]. In almost all test series, a shift of the gender ratio to 70♀ to 30♂ was found when the males were "starved". Mouse strain: NMRI. One example for the many experiments regarding cannibalism triggered by 4-deoxy-pyridoxine (I) carried out in Berlin from 1955 to 1969 (5, 9e) and in Brazil at UFSM from 1975 onwards is shown in Table 1. Apart from I, a number of other B6 anti-vitamins were tested only one of which, however, produced an effect corresponding to I. A description of one of the experiments with I is found in Table 1. All in all, another 20 basic series of experiments with I [each of which with 500 animals (400 female: 100 male)] were carried out over the years. The conditions [amount of I administered, time and duration of the I application (other rodents such as rats, golden hamsters, dormice)] were varied (9e,d). Experimental runs followed to determine the possible simultaneous influence of arginine and other amino acids, prolactin, testosterone and other factors (9a,b) and others not mentioned. As far as possible from a quantity point of view, other anti-B6 vitamins and related compounds were included in these experiments (9d). Unfortunately, the experiments relating to the synthesis of I analogues turned out to be time-consuming and complex. Experiments over several years on the improvement and facilitation of the synthesis of I also presented unforeseen difficulties (9c,d). The report on experiments carried with other animals such as rodents and fish is included elsewhere. The experiment comprised 40 pregnant mice each, 30 for the main test with I, 10 for controls. From day of delivery on every mother had its own cage and drinking dish with pellet feed. The weight was checked daily. I was offered in an aqueous solution in a concentration between 5 and 25 g of I per 1000 ml. The animals consumed approx. 5 ml of liquid per day. The solution I was first administered to the pregnant mice one day before birth and then for another 5 or 7 days. Feed and drink ad libitum (9e,d). The method described here, namely to create cannibalism "on command" by administration of 4-deoxy-pyridoxine (I) is primarily useful for research. 1 Experiments to improve the synthesis of I and to make it cheaper (9c), as mentioned above, unfortunately without success. However, this is not true for another analogue of I we synthesised; cf. 4. 2 Field experiments with bait containing I so far had a success rate of only 40% to 50%: rodents also look for other feed. 3 Field experiments with leaving bait containing no B6 at all had a success rate of only 20% to 30% as long as the rodents were free to choose their feed. 4 Field experiments with bait containing the analogue mentioned under point 1 above showed a success rate of 70% to 80% so far. A 100% success is prevented by the rodents being able to choose their feed. It was possible to carry out these field experiments in suitable institutions in Brazil from 1975 onwards with the aid of the industry: BRASTONE AG, HOECHST do BRASIL (results secreted). The author woud like to thank Dipl.-Chem. H.-J.Hein, (diploma in chemistry), for his cooperation from 1955 until 1962 (5,6) in organizing and starting up the mice experiments and later watching them over carefully. Acknowledgment of the contribution of Ms. Manjula Taneja , BSc., MSc. (India), to the project "Cannibalism and 4-deoxy-pyridoxine (I)“. After Mrs.Taneja “banishment” by the mentioned student team the author succeeded in continuing the work on the topic "Cannibalism" - unfortunately only in part - at the Brazilian Federal University Santa Maria, in Santa Maria, RS (UFSM) and with the aid of the local industry. In addition to his work in Berlin (FU), the author established a Central Chemical Institute at UFSM from 1963 to 1972 and was able to continue some of his research projects both there as "Diretor-Coordenador" and in Berlin. Each year, he spent several months in Brazil and cooperated with Brazilian industrial companies as well as with the university (UFSM). In Berlin the author tried to find once more graduate students for the project “Cannibalism triggered by Anti-vitamins” after 1975. Two fully decided candidates declared - shortly before beginning the work (after having already invested much time) - that they are forced to quit because of the forseable attacts by “student-collegues” (witness: Dipl.Chem.H.-J.Hein and Dr.F.Herzel). "The vitamin C complex as a stabiliser"
This was triggered by the necessity to stabilise pre-fabricated medical bulk merchandise such as SEREX before shipment to Japan by removing the residue of air oxygen through the addition of calculated amounts of vitamin C.
The vitamin C complex formulated in Plate 1, ascorbic acid [IIa] / dehydroascorbic acid [IIb] is stable if one of the three factors H2O, O2 and metal ions can be excluded. 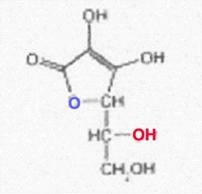 In the presence of O2 the component IIb is dominant in aqueous vitamin C solutions, evident from the yellow colouring. The publication dealing with this subject is shown as Plate 2 in the APPENDIX. However, it was not described in the paragraph "preservation of potatoes by heat" on page 172 how stabilisation of the heat-preserved potatoes was really achieved. At the express request of the manufacturer, the following sentence was left out in the published text after the passage "containing 1.5 % NaCl as the main component": "In order to remove oxygen from the filled vessels to be sealed, the amount of vitamin C calculated for oxygen (plus 10 %) was added." This was the only way to ensure that the vitamin C content of the heat-preserved potatoes remained stable over a longer period of time. (As mentioned earlier, vitamin C is degraded only if all three of the factors necessary for the degradation of vitamin O2, H2O and catalysing traces of metal are present.) For further details on this topic, please refer to the cited publications and lectures. Quotations (10a – h, and 11). The competitors, i.e. the manufacturers of deep-frozen potatoes became very agitated at the time and reacted negatively, as the publications (10f,g) show. There were many telephone calls from upset "customers". The reactions of the press were also very varied. A lot of fuss could have been avoided at the time if the author had been allowed to put all of his cards on the table (see above). In closing, let me point out that, in our case, there was no "vitaminisation" of potatoes. 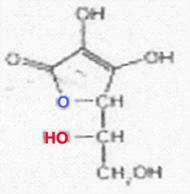 The vitamin C complex consists of L-ascorbic acid [IIa] and its primary product of oxidation, dehydroascorbic acid [IIb], IIb is biologically practically equivalent to IIa, contrary to 2,3-diketo-gulonic acid [IIc] produced by hydrating IIb and opening the lactone ring. In the formulation according to Emil Fischer, the C-atom which has the highest degree of oxidation is given the number 1. According to the definition, the L-configuration is evident from the C-atoms 5 and 6. 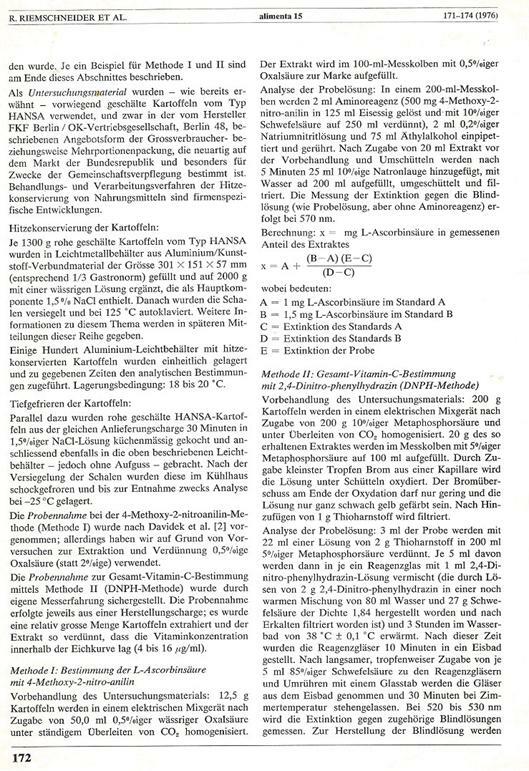 Additional information of monosaccharides and the terms “D” and “L” in the essay “Stereochemistry of Heptites” , there in Plate 4 “Kohlenhydratstammbaum” (D-Reihe) and in Plate 5 “Explanation of terms D and L”, published in this Journal (20); see also the monograph of the author (8b).In Plate 3 (our APPENDIX) ,on the other hand, the formulation is simply according to generation and derivatisation. How did we come to dealing with "heat-preserved potatoes" of the FKF company, Berlin? Patent attorney and certified chemist Manfred Miehe who had written his Diplom thesis under the guidance of the author at the FU submitted a problem that his client, FKF Berlin, was faced with to his supervisor: How stable is the vitamin C content in potato preserves developed by FKF? How can vitamin C be stabilised in "heat-preserved food"? Thanks to his experience with Serex4, the author saw a solution which, as the publications cited under (10a-k, 11) show, was put into practice within a few months. The above-mentioned medicament Serex4 aka Cellryl is a preparation developed by the author and registered for clinical use, namely for the treatment of ulcers, in Japan which was stabilised by the addition of an amount of L-ascorbic acid calculated for O2 before export to Japan (8a). This was triggered by looking for substances which, according to literature, have properties stimulating the metabolism. Over 30 years, a systematic study of defined chemical compounds as well as natural substances and preparations prepared from such substances was carried out with regard to increase or decrease of respiration in the WARBURG test or with regard to increasing the growth of tadpoles of Xenopus larvis DAUDIN. Both pangaminic acid preparations bought commercially and those we made ourselves did not show the slightest trace of stimulating respiration of liver homogenate. This was found both in our own WARBURG tests and in any other common lab test procedures for detecting an increase in metabolic activity during our research in the years 1977-82 (12). Our own experiments and the subsequent in-depth study of literature about B15 according to Table 2: 271 literature passages revealed that everything connected to the discovery and development of vitamin B15 can only be classified as criminal. Neither the constitution nor the vitamin character of B15 has ever been proven; more in Plate 4 (13-15). *) The references to literature in Table 2 refer to the literature citation (13). Unfortunately, more than 200 authors did not notice this and, in most cases, arrived at the wrong conclusions. The citations of all 271 publications we procured and translated where necessary are found in the essay: "About the undiscovered vitamin B15 (pangaminic acid)" (13), as are the formulae given by the "discoverers" in the U.S. Patent 2,710,876 dated June 14, 1955. None of the reproductions of this patent carried out in our labs by Thomas Wons, Klaus Hennig, Gerhard Quelle and Heidi Horak over five years resulted in the products described (12a,b). The medical application of preparations containing "vitamin B15" or pangaminic acid", respectively, as recommended in literature entails risks, as can be inferred from the excerpt of the publication "Existence of pangaminic acid - risk" aka "vitamin B15"? shown in Plate 4 (13 - 15) in APPENDIX. 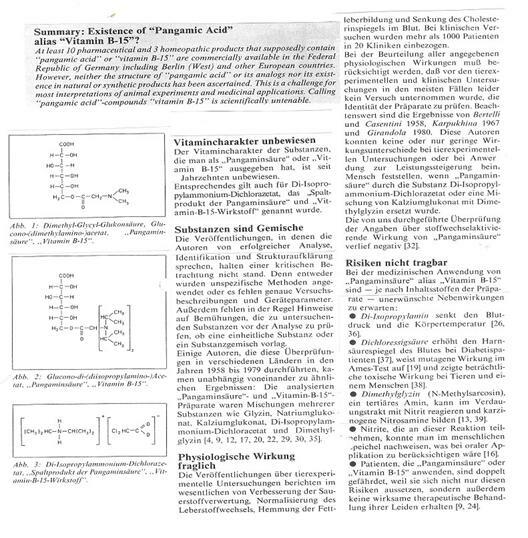 In der Literatur ist keine durch Pangaminsäure und Derivate (alias „Vitamin B15“) zu beseitigende „B15-Avitaminose“ beschrieben, geschweige denn experimentell bearbeitet worden, wie es für den Nachweis eines echten Vitamins notwendig gewesen wäre. Die 1913 von FUNK als Vitamine definierten organischen Verbindungen sind durch das Auftreten von speziellen Krankheiten (später als „Avitaminosen“ bezeichnet) entdeckt worden. Deren Heilung konnte geschehen, nachdem man die fehlenden lebensnotwendigen Stoffe in mühsamen, langwierigen Versuchen isoliert und identifiziert hatte: Vitamin B1 , identifiziert als Aneurin, heilend: Beri-Beri; - Vitamin C, identifiziert als Ascorbinsäure, heilend Skorbut ecc. Nichts dergleichen gibt es für „B15“ . Also „Hände weg“ von angepriesenen Pangaminsäure-Vitamin-Präparaten ! In the following SPECIAL SECTION, additional issues connected with the topics 1 and 2 will be discussed and also the Plates 2-8 in the APPENDIX. How the application of anti-B6 vitamins ever came about, i.e. how the properties of 4-deoxy-pyridoxine (I) which trigger cannibalism were discovered in 1955. The influence on the gender ratio of new-born rodents before and during copulation was studied in five experimental series from 1955 to 1962 on 5000 mice each (♀ : ♂ = 4 : 1). In the experimental series where we "starved" the male mice, i.e. kept their body weight constant at 20 g, the gender ratio of the new-born mice was 70 : 30. These results were confirmed in further test series. In some tests we reduced the B6 content in the diet of the mice and gave anti-B6 vitamin I (5a). In the test series with other anti-B6 vitamins synthesized in the meantime we were successful only in one case. However, this must be kept secret in the interest of an industrial enterprise (9d,e). In order to be able to carry out such comprehensive tests which involved many people in the cellar of the Geographic Institute of the Free University where we were "uninvited guests" for a certain time, we had converted a little used bicycle cellar into a mouse lab. The room was ventilated sufficiently, and on tables we installed 1000 plastic dishes and wire covers and drinking troughs (sponsored by BASF). The "mouse cellar" converted from a former bicycle cellar had been equipped with good ventilation. However, the construction department of the Free University had placed the outlet for waste air next to the large rhododendron shrub to the right of the main entrance of the Geographic Institute. At a departmental meeting the director of the Geographic Institute complained about the mouse odour which, depending on the wind, was noticeable more or less, but all he got as a reaction were grins, and no change was made. For easier understanding, here are a few remarks about the "accommodation" of the biochemical department during the time before we moved into our own buildings in Lichterfelde-Süd, Ostpreussendamm, and in Lichterfelde, Limonenstrasse. The department was first a sub-tenant at the Pharmaceutical Institute in Berlin-Dahlem, was then extended to occupy (by force) a few rooms in the cellar of the Geographic Institute in Berlin Steglitz. The geographer called from Jena, Prof. Dr. D. Schultze, had to accept this, just like the fact that both the caretaker and the author jointly used the only garage of the institute - the caretaker at night, the author during the day. Only after the renovation of the building of the Institute in Lichterfelde Süd was completed, did things become normal. In Lichterfelde-Süd, we were able to work chemically, but another solution still had to be found for purely biochemical issues, namely with the second building for the Institute at Limonenstrasse in Berlin-Lichterfelde (1950-1969). The author would like to point to the long-term cooperation of Ms. Taneja on the projects "Cannibalism", "Investigations of the vitamin B6 complex and its anti-vitamins in the intermediary metabolism", and "Cannibalism and 4-deoxy-pyridoxine". These were some of the above-mentioned 20 series of trials characterised by the example of Table 1, especially experiments to characterise the interference of 4-deoxy-pyridoxine (I) in greater detail and, if possible, to shed some light on it. In addition, Ms. Taneja compiled an almost complete collection of literature on the topic "Cannibalism", procured the most important original works and - where necessary - organised and financed translations. Ms. Taneja is a member of a high Indian caste and had substantial funds. Starting in 1964, she worked as an unpaid freelancer at the Biochemical Institute of the Free University of Berlin, first out of interest in scientific issues and later - with the encouragement of the author - with the objective of writing a thesis to be submitted later to her home university in India. 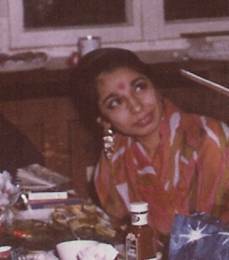 After the university reform - so-called democratisation of the university - Ms. Taneja lost her room in the institute at Limonenstrasse without any discussion in the seventies, mainly at the initiative of a student team3. Since the author was no longer director of the institute after the university reform, but "comrade professor team leader", he was unable to do anything about it and had to accept termination of this particular research. Ms. Taneja herself did not take any legal steps. She was deeply hurt and left the "University". As an Indian lady and member of a high caste she avoided any kind of dispute. Such an act would have been beneath contempt for her. This is why the scientific experiments to throw light on the effect of I could not be completed in Berlin - just as many other projects of the author and his colleagues. According to more recent investigations, the vitamins C and E are regarded as "transport vessels” for hydride ions (16): Plate 5 and 7 (23). Worth mentioning are discussions of the author with Professors Dr. H. Remy and Dr. H.H. Schlubach, Chemical State Institute of the University of Hamburg which, according to the records from the lab diaries, took place in 1940 and 1946 on the topic "Existence, stabilisation, detection and benefit of negatively charged hydrogen ions". The questions raised both in 1940 and later were: Can hydride ions be used to intercept radicals? Where do they occur in nature? Where should they be expected? Stabilisation? Are hydride ions better radical scavengers than the vitamin C complex? Accordingly, stable hydride ions exist in aqueous solutions which were detected qualitatively with all three methods and quantitatively with method 2: under suitable conditions, they are detectable for several weeks. In the opinion of the author, the therapy with fruit and vegetable juices successfully used by Prof. Dr. Walker in the U.S. has now been scientifically confirmed, as shown in the essay appearing as Plate 5 in the APPENDIX (16). „Vitamin-E-Komplex und Vitamin E-Nikotinat (d,l-α-Tocopherol-nikotinat) und deren durchblutungsfördernde Wirkung sowie deren vasodilativer Effekt auf die Haut“ (19a,b). Haut- und Massageöl (Castanum), based on Japanese Olbas Oil, developped in cooperation with Prof. Köhnlechner (21): cf Photos there. On the occasion of the meeting of Nobel prize winners in Lindau in the late sixties, the author had the opportunity to discuss his topic of special interest, ascorbic acid, with Prof. Dr. Lines C. Pauling (22), and to show him some Plates. For details, see quotation (23). The reader may have noticed that different manners of writing were used for ascorbic acid in the Plates 2, 3, and 6 to 8, depending on what required special explanation. The principle of speech to use the simplest expression possible also applies to chemical formulae. These are a kind of projection of spatial models (STUART or others) on paper, i.e. the formulae often do not show the position of the atoms vis-à-vis each other correctly. This is particularly evident when comparing the O arrangement of the I formulae in said Plates. Another example: To better show the asymmetry caused by C4 and C5, the I formulae shown in Plates 6 and 7 were rotated accordingly (C4 to C6 are positioned vertically). For reasons of originality, it may also be desirable to stick to the original manner of writing used in a publication; for example, this applies to the Plates 6 to 8 used as a kind of basis for discussion (23). 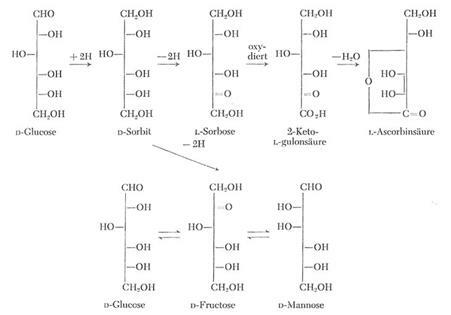 Connections in the form of formulae between important monosaccharides of the C6 series and derivatives formulated after their occurrence (not according to Fischer's rules, cf. also the formula scheme to IIa, IIb and IIc in Plate 1). 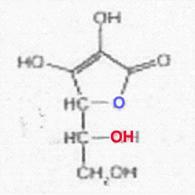 The structural chemical correlation between D-glucose and L-ascorbic acid [IIa] is of primary interest here. The II a pre-stage 2-keto-L-gulonic acid (Plate 1) is generated by L-sorbose oxidation (preparatively directly through catalytic oxidation with oxygen from the air at the platinum contact). See also text under Plate 1 and references (20,8b). "Existence of pangaminic acid alias vitamin B15?" Several companies that supplied pangaminic acid or vitamin B15, respectively, at the time, were informed by the author of the negative findings on this topic, for example through published articles (15). Reaction: None. Only one company answered to the effect: "Dear Professor, you may be right with what you say, but I am sure that we will continue to sell pangaminic acid for many years" (1985). 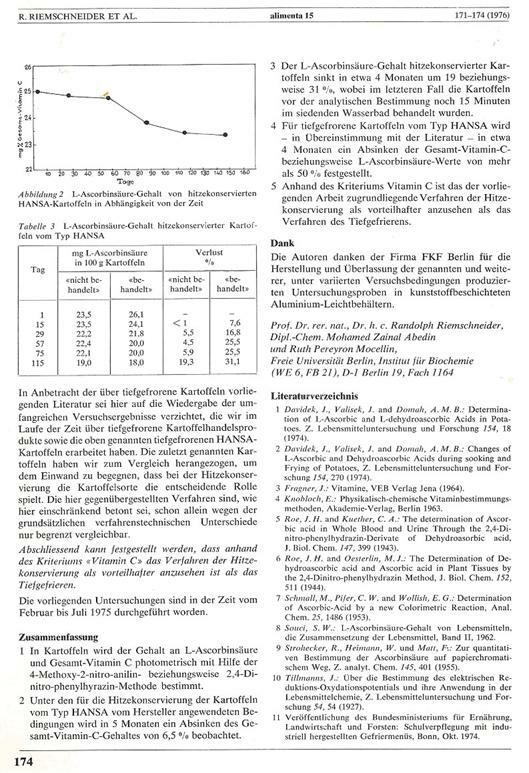 The author had trouble to place his publications about the non-existence of vitamin B15 or pangaminic acid in German technical journals. In particular, editors of pharmaceutical publications reacted negatively [perhaps to avoid the risk of losing advertisers (?)]. The article published in the journal "Fortschritte der Medizin" was accepted only following the intervention of Nobel Prize winner Prof. Butenandt. The author failed to place an article in the Soviet publication cited under (12c) to refute the false allegation that pangaminic acid promotes cell respiration. This was then published in "Kosmetik International 1983" (14). Many thanks for the valuable contribution of Mr. Gerhard Quelle on the project vitamin B15 and pangaminic acid. Mr. Quelle carried out the comprehensive literature studies mentioned above. Often the hydrid ions are so to speak "hidden", loosely bound in structure hydrides or organic compounds like NADH, flavonoides, vitamin C- and vitamine E-complexes. Vitamine E for instance acts as "transport vessel" for hydrid- ions. Hydrid-ions [ H-] respectively H-atoms [H = H+ + ө ] can be seen as "energy currency" of living systems. Below, some details about the two researchers and theresults of their research that have decisively influenced the areas under discussion: 1) Prof Dr Patrick Flanagan, USA, nominated for the Nobel Prize in 1964 and 2) Prof Dr Norman W Walker, also USA. The water of the Hunza contain no dissolved minerals in ionic form, but rather it is rich in extremely small mineral particles (colloids) and rich in hydride ions, only rarely found in most water. Flanagan describes Hunza water as "structured" (a sort of "liquid crystal"). The surface tension of Hunza water roughly equals that of our body fluids. Flanagan attempted to produce a "copy" of Hunza water, eg by adding appropriate colloids and seperately produced hydride ions (so-called microcluster colloids as Crystal Energy). Author’s laboratory manual: Notes of talks on 15 Mar 40 and in May 40 with profs H Remy (Anorganic Chemistry, University of Hamburg) and H H Schlubach (Organic Chemistry, University of Hamburg). "Possible protection against cancer through free-radical scavengers" ("Möglicher Schutz vor Krebs durch Radikalfänger"). Lecture given in LIONS Club, Berlin, in July 1962 at the invitation of attorney Dr Ludwig (owner of the Sportpalast), Prof Dr F Friedebold (director of the Oskar Helene Heim), Wolfgang Böttger (Consul General of Haiti) all of Berlin. All of the I-stereoisomers shown are optically active: C4 and C5 are centres of asymmetry. Because of the enzyme specificity, only the L-I has vitamin character among the I-isomers listed; D-I, L-iso-I and Di-iso-I are inactive. The low activity attributed to the isomer last mentioned could not be confirmed when working with the purest D-iso-I (free of L-I). Regarding the definition of D and L, see ref. (20). Lecture, given in July 1940 at Chemical Kolloquium of the Chemische Staatsinstitut, University Hamburg, in the course of the authors study of chemistry: Duration 40 minutes, chair: Prof. Dr.H.H. Schlubach. 1. Gegebene eigene Definition des Vitamin-Begriffes: Bei Vitaminen bzw. bei den Vitamin-Komplexen handelt es sich um organische Verbindungen, die 1) in kleinen Mengen mit der Nahrung aufgenommen werden müssen, die 2) der betreffende Organismus nicht selbst herstellen kann und die 3) aktiv in den Stoffwechsel eingreifen. 2. 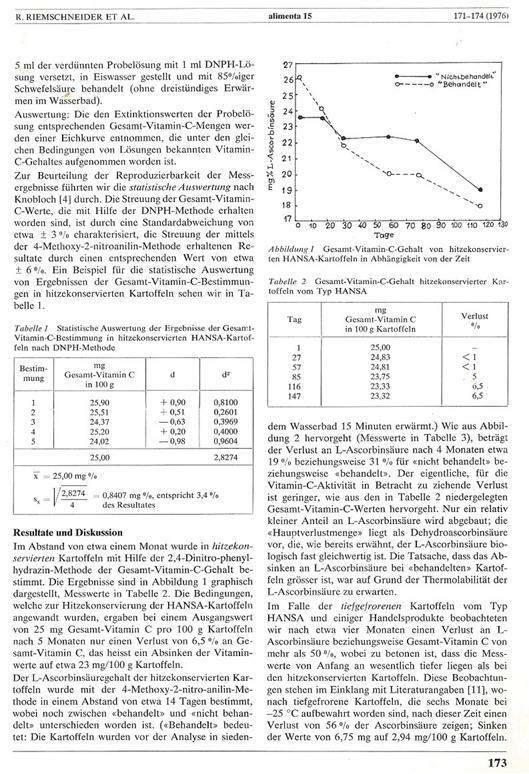 Man sollte von einem Vitamin-Komplex sprechen, wenn es sich um mehrere, in Wechselwirkung zueinander stehende Verbindungen handelt; zum Beispiel besteht der Vitamin C-Komplex aus L-Ascorbinsäure und Dehydroascorbinsäure [IIa/IIb]. Diese Betrachtungsweise spielt bei der Bestimmung des Vitamingehaltes in Naturstoffen eine entscheidende Rolle, z.B. (3a). 3. 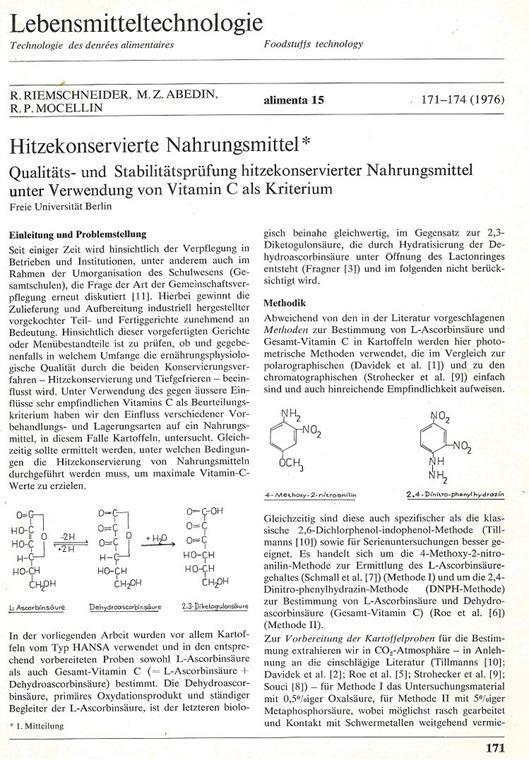 Wenn man von einem Vitamin-Komplex spricht, muß immer der zugehörige Organismus genannt werden: Der Vitamin C-Komplex IIa/IIb ist z.B. nur für den Menschen, einige Menschenaffen, Meerschweinchen und einige Vögel Vitamin. Die meisten Organismen können Vitamin C selbst synthetisieren. 4. Liste der bekannten Vitamin-Komplexe mit Formeln, eingeteilt in Wasser- und fettlösl. Vitamine gemäß Literatur. 5. Die wichtigsten Antivitamine sind diskutiert worden. Laborberichte Januar 1945, 14 Seiten; vgl. auch spätere Veröffentlichungen und Anwendungen (10a-c, 10h), hier im Aufsatz besonders Tafel 2 (ANHANG). Vortrag gehalten wie vorstehend im Dezember 1949 – nach Arbeiten von W.M. OTT, Proc.Soc.Exptl.Biol.Med. 61, 125 (1946), 66, 215 (1947). Cannibalism by administration of anti-B6 vitamins such as 4-deoxy-pyridoxin. Methods for rodent control (Kannibalimus durch Gabe von Anti-B6-Vitaminen wie z.B. 4-Desoxy-pyridoxin. Verfahren zur Nagerbekämpfung). Patent application in Brazil on December 30, 1961, by Dr. F.R. Pesserl, Curitiba, and M.M. Faria, S.Paulo, naming R. Riemschneider as inventor. Experiments on influencing the gender ratio of newborn mammals before and during copulation in 5 series of experiments with 5000 mice each (1000 ♂ : 4000 ♀) in plasticcages by keeping the male mice at a weight of approx. 20 g.
6 lab reports, 1955 - 62, 310 pages in total, prepared by H.-J. Hein (diploma in chemistry) on microfilm. The experiments were carried out in the years 1955 to 1962 in the Department of Biochemistry of The Free University of Berlin in a few rooms of the Geographic Institute in Berlin-Steglitz, Grunewaldstrasse, after an out-of-use bicycle cellar had been converted into a mouse lab. At the time, the large numbers of newborn mice were donated to the aquarium of the Zoological Garden (director Dr. Schröder) to feed the reptiles. On the negative influence of regular intact yeast (baker's yeast) given with the drinking water on the potency of male mice (Über den negativen Einfluß normaler intakter Hefe (Bäckerhefe) auf die Potenz von Mäuseböcken, verabreicht im Trinkwasser). Lab report June 1938, 15 pages. Abbreviated version published in 1938 in the students' magazine of Wilhelm-Gymnasium, Hamburg-Dammtor. These orientation experiments were carried out during the time from May 1937 to June 1938 with the approval of the administration of the Matthias-Claudius-Gymnasium, financed by the family of my school friend A. Suhr from the Wilhelm-Gymnasium. (Suhr studied medicine and obtained his M.D. after the war). These orientation experiments (which were not confirmed sufficiently for statistical purposes) were four series of experiments with a total of 960 mice of which 140 were controls. The ratio in the test series I and II was ♂ : ♀ = 1 : 3, and in the test series III and IV 1 : 4. Evaluation by the number of newborn mice. Result: Potency inhibition approx. 20 %. This report was continued in Bulletins II to XII (1946-84), entitled "Aphrodisiaka": PROJ XXII in (8a); cf. also (6). 26 PROJECTS, over 1400 references (in preparation), here concerning: PROJ. XXIII, bzw. XXVI. Antrag vom 30.6.1960, gerichtet an die Deutsche Forschungsgemeinschaft, Bonn-Bad Godesberg. 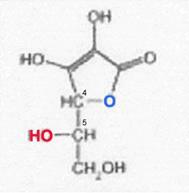 The term B6 comprises the three substances pyridoxol, pyridoxamine and pyridoxal which may be exploited by the organism in the same way. Pyridoxol is generally used for therapeutic purposes, because it is stable against heat, alkaline and acidic compounds. The really effective compound is pyridoxal-5-phosphate which is an essential co-enzyme of transaminases and amino acid decarboxylases for the amino acid metabolism. (sektretiert); cf. Table 1. There are protocols to each single animal of experimental series containing 500 mice each. Manuskript von August 1975, 21 Seiten (in portugiesischer Sprache); veröffentlicht in Revista Centro Ciencias Rurais, S.Maria 6 (2), 1976. Mitt. II: Kartoffeln auf dem Prüfstand – Mehr Vitamin C in hitzekonservierten oder in tiefgefrorenen Kartoffeln? Vortrag vom 15.6.1976 vor einem Gremium und Gästen der Firma FKF, Berlin 48; (nicht zur Veröffentlichung bestimmt); vgl. auch (11). *) Trabalho realizado no Instituto de Biochímica da Universidade Livre de Berlím, Alemanha Ocidental. Executor e Coordenador do Convênio entre o Departamento de Química da Universidade Federal de Santa Maria e o Instituto de Bioquímica da Universidade Livre de Berlím: Professor de Bioquímica, Dr.rer.nat. (Doctor of natural, Science) ; Dr.h.c. (Diretor do Instituto de Bioquímica da Universidade Livre de Berlím (West). **) Auxiliar de Ensino do Departamento de Química-UFSM. Lecture held on August 15, 1975 at the Central Chemical Institute of the Federal University Santa Maria, Santa Maria, Rio Grande do Sul, Brazil, on the basis of experience collected in Germany, Japan and Brazil. Manuscript December 1980, 14 pages (unpublished); Manuscript in the Portuguese language published in: Rev. Centro Ciencras Rurais, Santa Maria, Rio Grande do Sul, Brazil 9 (10), 120 – 125 (1979); also cf. (10a-e). Annotation: The time-honoured method of preserving vegetables or fruit practised by our grandparents (before 1930) is also based on the principle of oxygen removal and a vitamin C reaction: The air is largely removed by heating, and the bottles are sealed hermetically upon cooling. The remaining oxygen is eliminated by the reaction with vitamin C. Any micro-organisms present have been exterminated by heating. Comment on the publication of A.K. Selezneva: Kletochnoe Dykhanie Norme Usloviyakh Gipoksii 1979, 108 – 109; Ed.. Khvatova, E.M. Gor’k.Med.Inst. Gorky, USSR, with the title: "No cell respiration-promoting effect of 'pangaminic acid'", manuscript 1982, sent by registered letter to this magazine and institution in the USSR without ever receiving an answer. - Perhaps our manuscript never reached the recipient(s). Reminders had no success. In der Bundesrepublik Deutschland, einschließlich Berlin (West), und anderen europäischen Ländern werden mindestens zehn pharmazeutische und drei homöopatische Präparate vertrieben, die „Pangaminsäure“ oder „Vitamin B15“ enthalten sollen. Gesichert sind jedoch weder die Konstitution der „Pangaminsäure“ oder ihrer Analoga noch ihre Existenz in der Natur oder in synthetischen Präparaten. Die Interpretationen der meisten tierexperimentellen Untersuchungen und medizinischen Anwendungen sind in Frage zu stellen. „Pangaminsäure“- Verbindungen als „Vitamin B15“ zu bezeichnen ist wissenschaftlich unhaltbar. ; cf also Plate 4. Bi-Mouthly Journal of BWW’s WHO’S WHO Society, Jan 2004, Irvine, Cal., USA Internet: http://www.bwwsociety.org/journal/html/hydrid.htm; Jan. 2004; copy in APPENDIX as Plate 5. Kollagen und Vitamin C-Gehalt von Humanplazenten. Die Texte der Vorträge vom Jan. 1945 und Mai 1946 sind hektographiert und nach den Vorträgen an die Anwesenden verteilt worden. Manuskript Dez 1947, 10 Seiten. In Zusammenarbeit mit Dr. med. H. Vogt in Berlin konnten vasodilative Effekte von V auf der Oberfläche menschlicher Haut (ohne gleichzeitige Rötung wie bei Benzyl-nikotinat) beobachtet werden. Exakte Beweise stehen noch aus. Es fehlte uns eine gute Messmethode zur Registrierung von winzigen Temperaturdifferenzen und/oder zur Registrierung von Veränderungen der Wärmeleitung. http://www.bwwsociety.org/journal/html/heptites.htm 2007; there plate 4 and 5 with explanation of term “D” and “L”. Protokolle der Entwicklung 1983; cf. SPECIAL PART, Re. : Topic 2. As mentioned above, the author attended the Nobel Prize winner meeting in Lindau described below and had occasion to speak with some of the lecturers, Prof. Dr. Linus C. Pauling among them. Lecture on "L-ascorbic acid" on the occasion of the meeting of Nobel Prize winners in Lindau in 1969. Prof. Pauling reported experiments where L ascorbic acid (I) was administered in comparatively high daily dosages to persons for cancer prevention; at the time, he was instantly criticised from a physiological point of view. 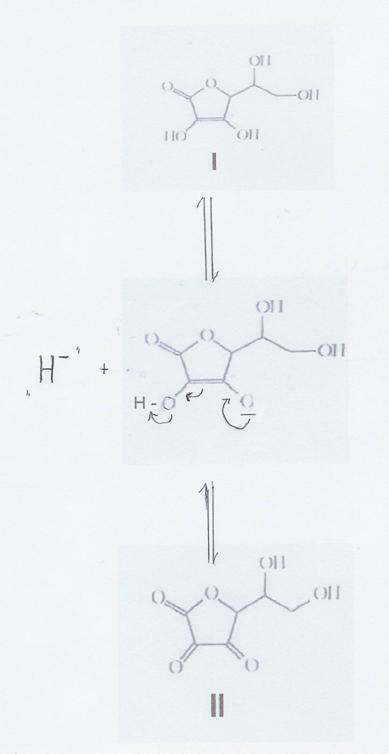 However, the significance of the hydride ions as radical scavengers and the function of ascorbic acid (I) and dehydroascorbic acid (II) as a "transport vessel" for the hydride ions had not fully been recognised over 35 years ago. re a) In connection with the use of ascorbic acid in amounts which are considerably above the necessary daily dosage, the author reported his own toxicological experiments with rats. For I, the DL50 was determined to be about 12 g per kg of rat, i.e. for a humans of 60 kg, the DL50 would be approx 0.72 kg, which is outside any discussion. - In case of oral application of I to rats, our own experiments showed that the concentrations of oxalate and therefore urea in the blood plasma increased only after application of 20 mg I per kg. The author had carried out these experiments in connection with gerontological experiments also including I (24a-c). This discussion was not held in public, i.e. not after the lecture of Pauling, so as not to encourage criticism of Pauling's experiments. In the opinion of the author, it is still justified on the basis of today's knowledge to take an additional 100 mg of I per day if it is intended to exploit the radical scavenger effect of I for some time. re b) Because of his long involvement with stability, function and detection of hydride ions, the author used Plates 6 and 7 to discuss the contexts formulated there and met with Pauling's approval, just as for Plate 8 dealt with under c) below regarding theoretically possible I isomers. Regarding the significance of hydride ions as radical scavengers, cf Plate 5 (16). 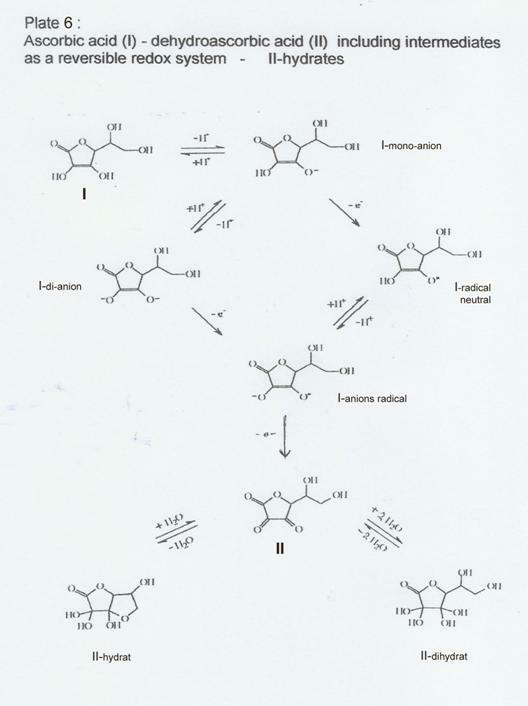 re c) I-isomers and their "vitamin C character"
At the time, the author intended to include the theoretically possible stereoisomers of ascorbic acid formulated in Plate 8 in his work on cis-trans-asymmetry (25). The author asked Pauling whether the latter had looked into the synthesis of the iso-isomers. Both scientists agreed that, owing to the specificity of the enzymes involved, only L-ascorbic acid (in combination with the L-dehydroascorbic acid) will show vitamin characteristics. For instance: Vitamin C is only a vitamin for humans, some anthropoide apes, guinea-pigs and some birds, because of lacking a certain enzyme; all other living creatures can synthesize ascorbic acid by themselves – as far as have been studied. The synthesis of I and I-analogues has to undergo several steps and is therefore rather complicated. In this respect, the author owes special thanks to Prof. Dr. Kinawi and Dr. R. Martin who worked on the imrovement of the I -synthesis and also I-analogues thereof in Berlin and Brazil over several years (9c,d). Due to the university reform at the FU in Berlin in 1969, the institutes were replaced by scientific boards or central institutes headed by boards of “directors”. The scientific boards were then cleaved into several work groups each of which was managed by one or more university lecturers. Later, there were even work groups without university lecturers, so-called student teams which, as the above example shows, even had the power to destroy genuine research. Original German text: Durch die 1969 stattgefundene Universitätsreform der FU Berlin sind die Institute durch wissenschaftliche Einrichtungen, bzw. Zentralinstitute ersetzt worden, geleitet von Direktorien. Die genannten Einrichtungen “zerhackte” man dann in Arbeitsgruppen, geleitet jeweils von einem oder mehreren Hochschullehrern. Dann gab es sogar Arbeitsgruppen ohne Hochschullehrer, sogenannte studentische Arbeitsgruppen, die, wie obiges Beispiel zeigt, sogar die Macht hatten, echte Forschungen zu zerstören. SEREX alias CELLRYL is a drug developed by the author which was used in Japan for approx 20 years. It was made of calf blood in Germany and exported to Japan to be filled in ampoules in quantities of up to 30,000 l per year until the BSE crisis broke out: Project XXIII, described in (8a). Limits of yellow colouring in case of SEREX taken into account in the quality standards of the product and agreed with the Japanese customer. For example, more than 5000 guests were invited to Ms. Taneja's wedding in India. All cited papers had been studied in the original first and most of them had been translated for further research. Die Funktion eines auf Zeit gewählten „Geschäftsführenden Direktors“ einer wissenschaftlichen Einrichtung an der FU ist nicht vergleichbar mit einem „Institutsdirektor“ - ernannt vom Wissenschaftssenator mit Urkunde - ist kein Widerspruch zu oben gemachten Ausführungen3. Man ist und bleibt als solcher „Genosse-Professor-Arbeitsgruppen-eiter“ einer „winzigen“ Arbeitsgruppe, gehörend zu einer wissenschaftlichen Einrichtung, vgl. auch note 3.